The solicitor representing the player said "it has been a long time coming". Crewe Alexandra said it did not "consider it appropriate to comment on individual cases that are being dealt with by its insurers". The club reiterated it "sincerely regrets the abuse committed by Barry Bennell and expresses its deepest sympathies to the victims and survivors". He said: "Hopefully they [Crewe Alexandra] have seen sense now; they know what needs to be done, they know the right thing to do by survivors and hopefully they will do that. "The question is, 'will that happen? ', and the sooner the better, really." But Mr Nocivelli said the club had not apologised to the victim, adding: "It is not just about the money. It is about someone accepting responsibility and apologising for their failings." 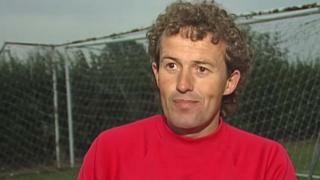 Image caption Crewe Alexandra said it "regrets the abuse committed by Barry Bennell"